Soaring ceilings, a HUGE yard, open floor plan, 4 bedrooms AND a home office. This all brick ranch home is priced really well, at only $150,000! This all brick ranch Monrovia home for sale sits on an almost half acre cul de sac lot in Monrovia. Ladies, you’ll love the abundant counter space in the kitchen! The kitchen is open to the family room making it a perfect home to entertain in. The large great room features a fireplace and lots of natural light. The home office features french doors and could easily double as a formal area/bonus room. The spacious Master retreat is isolated and features a glamour bath, with an abundance of closet space. You’ll appreciate the large tub and separate shower. Outside, you’ll enjoy the large patio and huge yard…the perfect place to wind down! 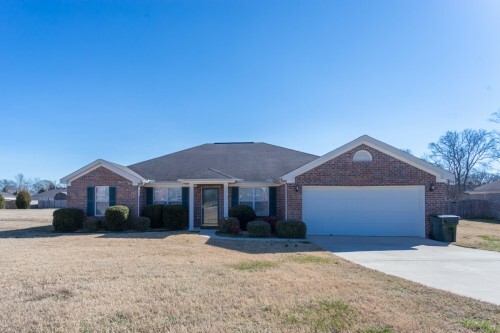 145 Danforth Drive, Harvest Alabama is ready for a new owner! For a private tour, give us a call. We don’t think this home for sale in Monrovia will last long on the market!